Perth Archbishop Timothy Costelloe with youth from Perth who were in Poland, together with Auxiliary Bishop Don Sproxton for the 2016 World Youth Day with Pope Francis. Photo: Catholic Youth Ministry Perth. With these words Pope Francis addressed more than 1.5 million young people at the closing World Youth Day Mass, held at Krakow’s Campus Misericordiae, on 31 July. The Mass brings an end to Pope Francis’ five day visit to Poland – a trip which saw the Pontiff visit the site of the former Nazi death camp at Auschwitz, travel to Poland’s most revered shrine, the Jasna Gora at Czestochowa, and attend the World Youth Day gatherings. Reflecting on the Gospel story of Zacchaeus, an infamous tax collector who, due to his short stature, climbed a sycamore tree to see Jesus, Pope Francis made various analogies between the obstacles that prevented Zacchaeus from seeing Jesus and those that today do not allow young people to fully live their faith. 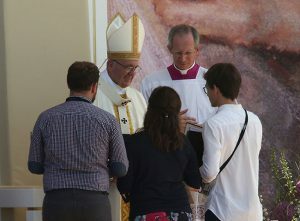 In one of many exhortations urging young people to fearlessly receive Jesus Christ in their lives, Pope Francis emphatically told the youth to not “be afraid to say ‘yes’ to him with all your heart, to respond generously and to follow him! Don’t let your soul grow numb, but aim for the goal of a beautiful love which also demands sacrifice. “When it comes to Jesus, we cannot sit around waiting with arms folded; he offers us life. We can’t respond by thinking about it or ‘texting’ a few words,” the Pope told young people, thousands of whom had spent the night camping at an area dubbed the Field of Mercy. “Even today we can risk not getting close to Jesus because we don’t feel big enough, because we don’t think ourselves worthy. This is a great temptation; it has to do not only with self-esteem, but with faith itself,” he said. The Pope warned the youth that if they do not accept themselves, they risk denying their “real stature” as children of God and see themselves as unworthy of God’s love. At the same time, he added, people will try to convince Christians that there are others who are unworthy of God’s love. The Pope also explained that when Jesus looked at Zacchaeus, He did not take into consideration his sins, wealth or place in society. Pope Francis greets young people as he celebrates the World Youth Day closing Mass July 31 at the Field of Mercy in Krakow, Poland. Photo: CNS/Bob Roller. kind of cell phone you use are of absolutely no concern. He doesn’t care whether you are stylish or not, he cares about you! In his eyes, you are precious and your value is priceless,” the Pope said. In his farewell, Pope Francis invited the youth to continue along the path that began with their pilgrimage to Krakow and bring the remembrance of God’s love to others. “Trust the memory of God: his memory is not a ‘hard disk’ that saves and archives all our data, but a tender heart full of compassion that rejoices in definitively erasing every trace of evil,” the Pope said. More than 180 Western Australians were in Krakow for the World Youth Day and meeting with Pope Francis. The Perth group, which travelled to Rome and Turin before making its way to Poland, was later joined by Archbishop Timothy Costelloe and Auxiliary Bishop Don Sproxton, both of whom celebrated a Holy Hour and Mass with the pilgrims at Our Lady of Mercy Parafia Rzymskokatolicka NMP Matki Miłosierdzia in Warsaw on Friday, 22 July. The Perth contingent was also privileged to participate Days in the Dioceses, a series of pre-gathering events that includes catechesis, networking, prayer and worship. Taking place in the week prior to the main WYD event, every diocese in the country hosts pilgrims in an effort to show them the richness of the local Church and welcome them through hospitality. For many of the pilgrims, their highlight was staying with their host families and spending time with the young volunteers from the parish. 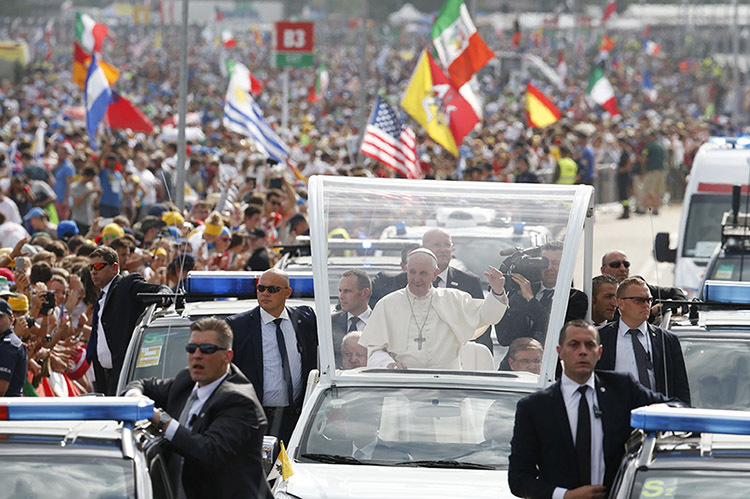 Pope Francis greets the crowd as he arrives to celebrate the closing Mass of World Youth Day at Campus Misericordiae in Krakow, Poland, on 31 July. Photo: CNS/Paul Haring. Jonathan Kavanagh, a first time WYD pilgrim, stated that one of the highlights of his time in Poland was getting to know the various host families and the loving volunteers. “We really bonded like we’ve known each other for a very long time. “It was sad to leave because in such a short amount of time we got to know them really well. It was really difficult to say farewell,” he added. The group will be making its way back to Perth this week. Although bustling locations such as Campus Misercordiae and Blonia Park are empty now in Krakow, the echoes of Pope Francis encouraging young people to take risks, to be courageous and to rise from one’s comfortable sofa and leave a mark on life can still be heard. The Pope arrived in the land of his predecessor, St John Paul II, with a message of mercy and hope in a time that has unfortunately seen much terror and violence. He had moments of solemnity and silence, particularly throughout his visit to the Auschwitz concentration camp and prayer time in the cell of St Maximillian Kolbe. The Pope also had an emotional moment during his visit to the Black Madonna of Czestochowa. With this, however, also came moments of joy at seeing thousands upon thousands of young people from around the world cheering for him and willing to receive his message. 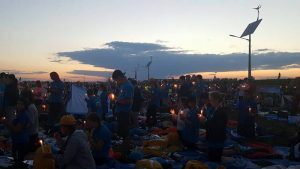 According to Vatican Radio correspondent Lydia O’Kane, what was clearly evident in Krakow in the final moments of the World Youth Day was that the youth were ready and willing for the challenge. Ms O’Kane reported that the young people she saw wanted to show people back in their own countries that it’s OK to stand up and express one’s faith with pride. They want to show, O’Kane reports, that there is a cheerful aspect to the Church and that they want to let it shine through just like here at World Youth Day. They also want to tell their communities back home that Jesus is alive and his mercy never ends. Before concluding the final Mass, Pope Francis announced that the next World Youth Day will be held in 2019 in Panama. 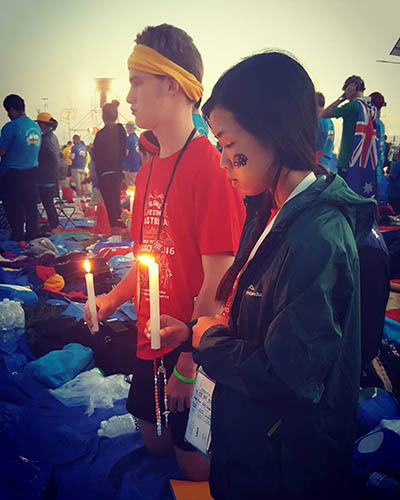 Two Australian youth during the vigil celebration with Pope Francis at the 2016 World Youth Day, Poland. Photo: Catholic Youth Ministry Perth. He invited the bishops from Panama to join him at the centre stage in blessing the crowd.